Brexit benefits world, not just U.K. Since the end of World War II (WWI, Act II), the virtue of a United Europe has been implicitly accepted and propagated as an article of faith. The previous two wars came about, the story goes, because nations fought nations; therefore, the path to peace and prosperity must lie along the road to unity. Today, a military union (NATO) guarantees European security from external threats, and a customs union virtually does away with trade barriers, leading to greater trade and prosperity for all. As this union expands to encompass more and more members, replaces petty nationalism, the resultant democratic supernation grants increasing numbers of Europeans the freedom to live, work and prosper in any member nation. This is the United Europe ideal. The Brexit vote showed it to be bankrupt. Much ink and bandwidth has been spent attacking the result and stigmatizing Leave voters as xenophobes and economic regressives. Such flabbergast and cognitive dissonance was to be expected since nothing panics status quo apologists quite like the effective expression of public dissent. By the same token, not enough attention has been paid to the merits of the winning side or to the specious reasoning behind the Remain camp. European Union is based on the false presumption of a common European identity, as if all Europeans were somehow like-minded. This is the same error Karl Marx made when he burbled enthusiastically about the European working classes uniting to overthrow the bourgeois capitalist hierarchy. Once the means of industrial production were in the workers’ hands, he famously declared, the state would “wither away.” The great communist revolution never happened and never will, and the idea of the state withering away, was pure delusion. 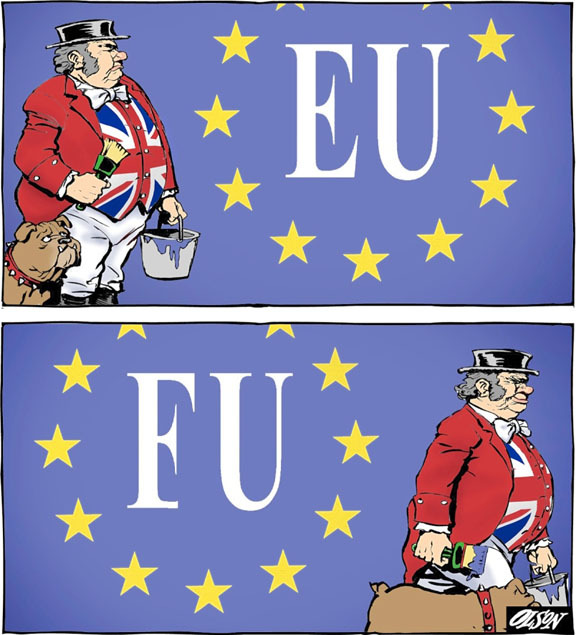 European union is no less fanciful. People identify with their nation, not their class or continent. We speak of Greeks, Spaniards, Poles and Belgians, but it makes no more sense to speak of Europeans in any demographic or ethnic sense as it does to speak of Asians or Africans. This is particularly true of Britons who identify the least with Europe. In October 2015, The Daily Mail reported that 64 per cent of Britons felt themselves to be purely British, whereas only one in six self-identified as European. The most Europhilic member states were Germany, Luxembourg and Malta. 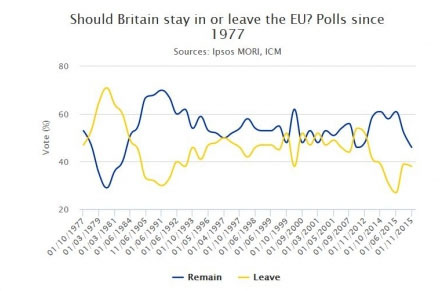 As the table above shows, British affection for European membership had been broadly falling since 1991, so Brexit merely put paid to a pre-existing attitude. It may be true, however, that the Leave vote reflected public fear of a mass influx of refugees fleeing the effects of NATO’s warmongering. This is especially true of the millions of displaced Syrians who are straining the resources of many European nations. However, much of this anti-immigration sentiment was contrived hysteria fanned by a constellation of climate change deniers that want the U.K. to be free from European environmental standards. The group DeSmogUK developed an intricate map showing the incestuous links and influences among Euroskeptics and climate-change deniers, who have offices at 55 Tufton St. London. DeSmogUK’s director Nick Deardon lambasted pro-Leave MPs not only for pandering to xenophobia and reactionary imperial sentiment but also for promoting an accelerated version of the heinous pro-corporate Transatlantic Trade and Investment Partnership. “Under these conditions, it’s even more important that organizations and activists redouble their efforts to oppose toxic trade deals, corporate power grabs and above all defend the rights and dignity of migrants,” he said. One cannot completely discount anti-Muslim xenophobia or anti-climate change obscurantism for the vote, but it would be wrong to reduce it to these two factors. Brexit is just the latest, most conspicuous, example of democratic alienation that has been a fact of life in Europe for more than two decades. 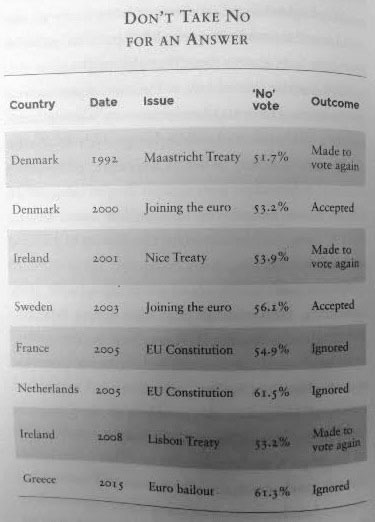 As the table opposite shows, popular opposition to the EU has been ignored eight times since 1992, including twice in Denmark and Ireland where the public were forced into a revote for a treaty they didn’t want. As expected, a move is afoot to have the Brexit put to a revote. 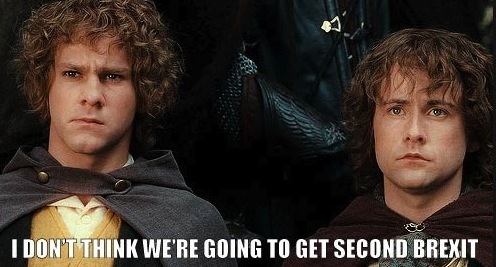 Allegedly there’s a petition with 3 million signatures in favour. The odds of it happening are slim, but the fact it’s being discussed is disturbing. It’s hard to criticize the Leave forces since it was Prime Minister David Cameron who gambled re-election on a referendum that he thought would deliver a sure-fire, pro-Europe outcome. If anyone is responsible for “Brexit,” he is, but he has since resigned, and the even more supine Theresa May now occupies 10 Downing St. What started out as a cynical political ploy to ensure re-election turned out to be a great exercise in popular democracy, and nothing upsets the status quo more than a well-organized expression of political dissent. To hear Europhiles tell it, the U.K. public committed economic suicide by sacrificing its free-trade access to the European market of half a billion people. The British economy will shrink, the pound will be devalued, and the British standard of living will fall, or so we're told. Yet, there is little evidence to back up this doomsday scenario, which sounds distinctly like empty fearmongering. As Padraig Reidy, editor of the London-based magazine Little Atoms, wrote: “The vote was a reflection a growing divide between a metropolitan élite that has flourished in a globalized economy and a populist anger on the part of those who feel left behind.” The Remain forces predictably scored 75% in the City of London, the capital of European financial capital where around US$2.7 trillion is traded every day and another $1.65 trillion in world client assets is managed. The feeling of alienation among Leave voters is borne out by Europe’s cult of austerity, globalization and deregulation that has turned multinationals and banksters into economic warlords that blackmail sovereign governments and beggar Europe’s poorest societies. Essentially, the European Commission, IMF and European Central Bank together form an economic troika that wields the real power. We’ve already seen how Goldman Sachs’s predatory lending and the ECB’s coercion helped ruin Greece’s economy and force its government to enact gratuitously punitive austerity measures. Leave voters had every right to fear that the same could happen to England. Finally, Britons won't have to endure the spectacle of their prime minister prostituting British interests to serve foreign governments. Because of Brexit, the U.K. will not be tied to any future EU-China free-trade deal (read: “corporatist sell out”). David Cameron was Beijing’s man in Brussels, and he backed a feasibility study of such a deal along with an EU--China investment pact. Without the British poodle in place, the further deterioration of Britons’ political and economic rights has been stanched, at least for the time being. When we’re fighting terrorism and Islamist extremism are we better doing that out on our own or fighting together with our European partners. When Europe is discussing its attitude towards Israel do you want Britain —Israel’s greatest friends—in there opposing boycotts or do you want us outside the room, powerless to affect the conversation. Aiding and abetting Israel’s war crimes is not what most Britons think of when the subject of European democracy comes up, so it’s hard to see how voting to distance the U.K. from it can be criticized. [The U.K. will] continue to have access to the EU’s markets as World Trade Organization rules prevent the EU from imposing unfair, punitive tariffs on U.K. exports. Furthermore, Britain could quite legally “compensate” exporting firms for costs they might face. The Brexit vote stands as a rare victory for politics over economic determinism. The European Union is a dictatorship; there’s no democracy in it. They have a parliament for show but it has no power. The power is in a non-elected commission that makes the decisions. So the government of the EU is removed from the European people. The Delian League (or Athenian League) was an alliance of Greek city-states led by Athens and formed in 478 BCE to liberate eastern Greek cities from Persian rule and as a defence to possible revenge attacks from Persia following the Greek victories at Marathon, Salamis, and Plataea in the early 5th century BCE. The alliance of over 300 cities would eventually be so dominated by Athens that, in effect, it evolved into the Athenian empire. Athens became increasingly more aggressive in its control of the alliance and, on occasion, constrained membership by military force and compelled continued tribute, which was in the form of money, ships or materials. Following Athens’ defeat at the hands of Sparta in the Peloponnesian War in 404 BCE the League was dissolved. As the modern analog to imperial Athens, the U.S. used its European “alliance” to expand its own imperial control. According to declassified State Department documents, the Central Intelligence Agency was the chief financier of European union from its beginning in the late 1940s. The American Committee for a United Europe (ACUE), a CIA front, covertly provided 53.5 per cent of the movement's funds in 1958, and financial support continued through Nixon’s presidency. It’s much easier to exercise control over a collection of states with a central government than a dozen or more individual states with sovereign governments. Leaving aside whatever emotional, nostalgic or pragmatic appeal it may hold for Europeans and their sympathizers, union was always a U.S. (now Isramerican) concept that at times entailed coercion of skeptical European states to fall into line. Britons’ rejection of continued union should be seen a vote to reclaim some measure of sovereignty from the Isramerican Trojan Horse. That is easy enough to do. Given the redundancy of EU trade agreements, the EU’s autocratic political structure, the EU’s bankster-driven economic tyranny and the military overlordship of Isarmerica, Brexiteers have nothing to answer for! Besides, as the table below shows, belonging to the EU hasn’t done much for non-plutocrats. 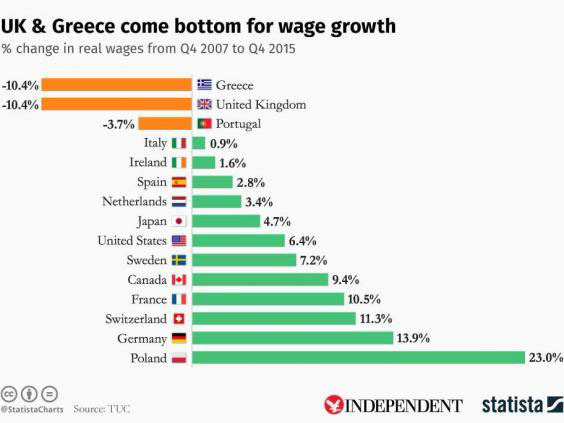 From 2007 to 2015, wage growth in the U.K. was as negative as it was for Greece, the worst in the EU. Furthermore, by January this year real wages for British workers had fallen by £44 per week from 2008. Economic arguments for staying in the EU clearly don’t add up. For that matter, neither does any other argument. The Brexit vote should be the first step in the U.K.’s general disengagement from European pseudo-governance, especially NATO. As Isramerica’s main cat’s paw, Britain had supported anti-Russian sanctions, subversion of Ukraine’s government and bombing Syria or any other country Israel wants hit. Without the U.K., the danger that Europe will sanction World War III has lessened. That alone is reason for the world to praise the result.